Eager to make ours an adventure, we did our homework first. 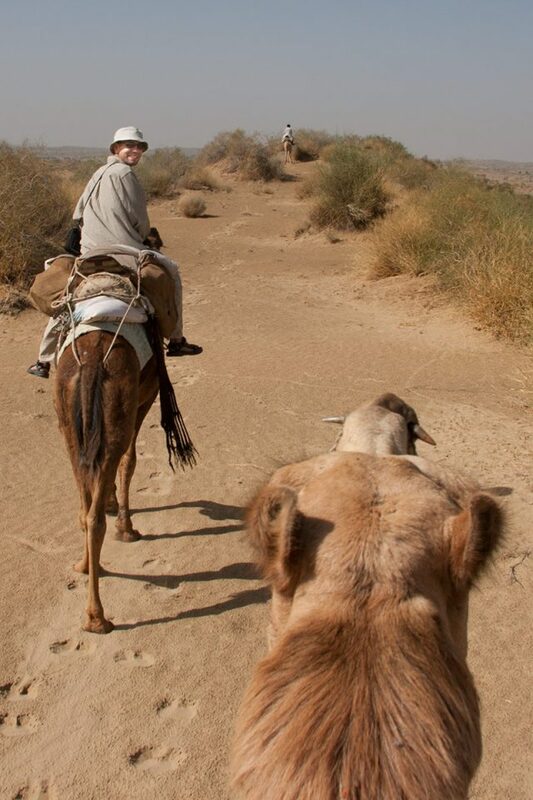 There are endless options in Rajasthan, but we wanted to get out into the desert, away from the hordes. Wildlife and scenery, rather than comfort, were our priorities, and we were hoping to get a glimpse of the unstaged version of traditional Rajasthani desert culture as well. 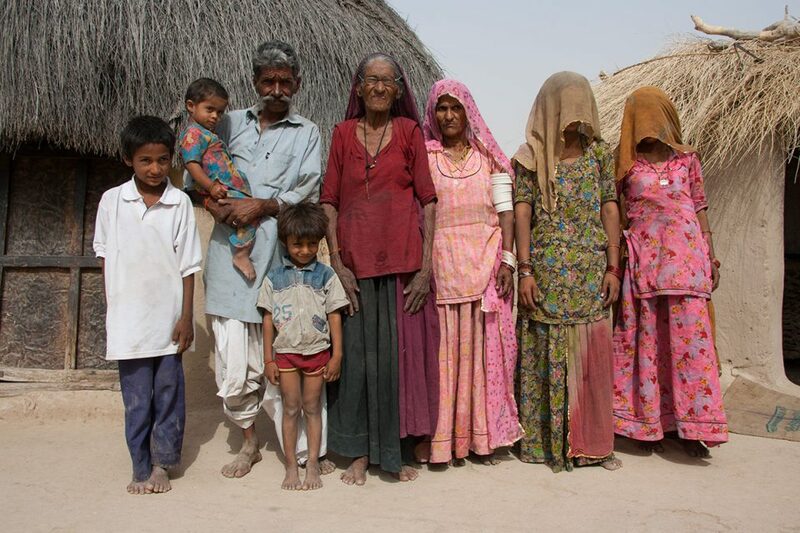 After reading up on the options and talking to other travelers, we decided on Khuri, a small desert village about 40 kilometers southwest of Jaisalmer. To ensure we could get away from the tourist grind, we went off-season and opted for a three-day safari rather than the typical overnight trip. 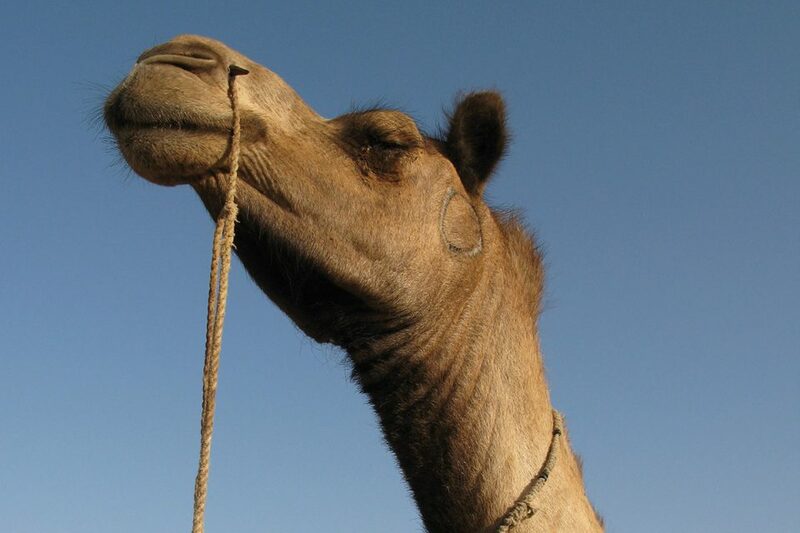 On camel trips in many countries, the camels are roped together into a line and tourists are pulled through the desert; other trips may have a guide on foot leading your camel along. While such tours have their place, they leave me feeling like I am on a ride at Disneyland. 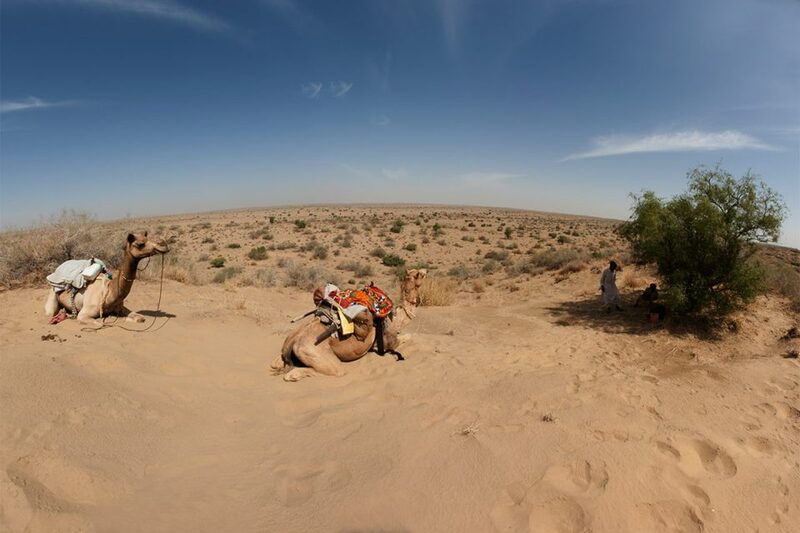 In Rajasthan, some desert safari operators offer visitors the unique opportunity to really learn to ride a camel. These trips are for desert dreamers, for those who want to gallop through the scrub like some modern-day Laurence of Arabia. Leaving early to beat the heat, our guides quickly led us out of the village, handed us the reigns, gave us two minutes of camel riding instructions, and off we went! As we rode away from Khuri, we rocked and swayed our way past a line of women dressed in colorful saris walking back from the village well balancing huge silver pots of water on their heads. Unexpectedly, the dry thorny trees around us were filled with peacocks and peahens wailing in the wind. Chinkara gazelles grazed on what looked like empty stretches of hard-packed sand. In the distance, a ridge of sand dunes rose up before us like a natural wall between the village and the open desert beyond. It took a few minutes to get used to controlling the camels – they’re big animals – but by the time we reached the dunes, we felt like old pros. Following our guides and enjoying the views of the desert around us, we made our way up and over the dunes to a tiny village of traditional adobe compounds beautifully painted with abstract desert designs. Unfortunately, this little village was a little too picturesque for its own good. Only an hour by camel from Khuri, it seems this one settlement was THE desert village for tourists who do short afternoon safaris. Hordes of dusty desert children demanded to have their pictures taken and ordered us to enter their beautiful houses to take pictures. Clearly the little monsters were used to tour groups with pockets full of candy and treats as tribute to the little bandits. Fearing the resulting shakedown, we declined, preferring to simply stroll around and take in the beauty of the village. But when we did not want to take their pictures, the little brats picked up several rocks and switched into mafia mode. This is the negative side of tourism, which we have seen in many pockets around the world. Strangely though, this terrible behavior was limited to the first settlement; we would quickly discover that only a few miles away travelers were a very welcomed, rare novelty. After a quick departure from the village, we rode for another hour or two until the heat became too unbearable. We found a shady space under a tangled tree high up on a dune-covered ridge with magnificent views of the surrounding desert. 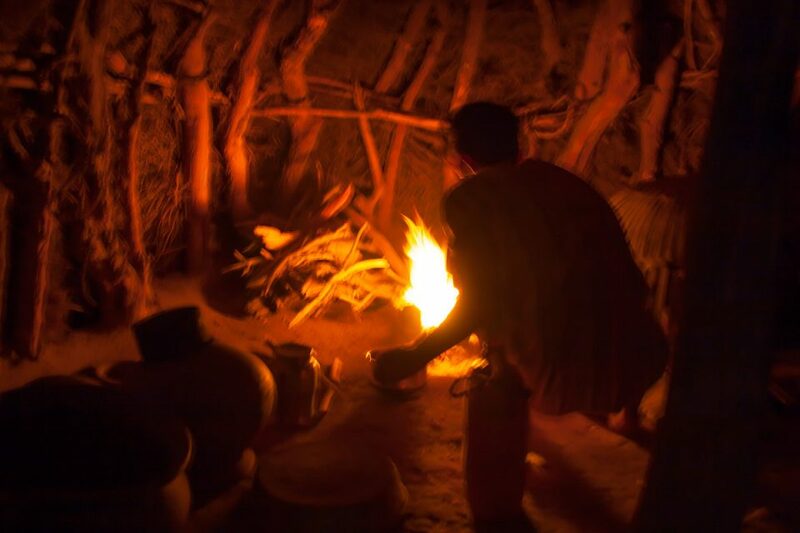 While we hid from the heat, our guides spent TWO hours making curried vegetables and home-made chapatis over an open fire. We all stuffed ourselved and slept the afternoon away until around 4 PM, when it was cool enough to continue riding. As we left the ridge, Thomas pointed out clouds forming on the horizon and asked our guide if he thought a storm was coming. The guide ensured us there would be no storm. Clearly, you should not expect an honest response from a person whose income depends on the answer. We slowly worked our way along a series of ridges across expanses of scrub through dunes and the occasional grassy patch filled with gazelles. 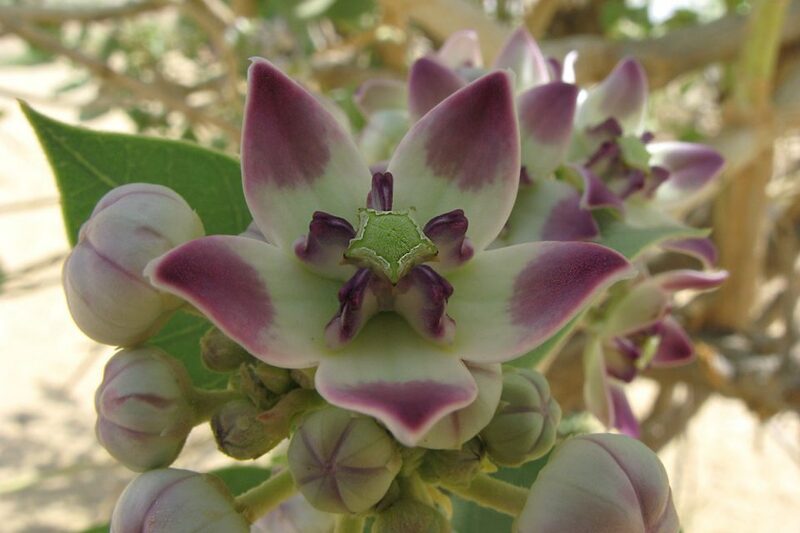 Strangely, colorful blooming flowers hung from the bone-dry bushes and trees, like ornaments left by nomads to beautify the monotone browns of the desert. At one point, we rode across a flat plain of hard-packed sand covered with large lizards. Their grey-black skin reflected a metallic rainbow sheen. They posed and threatened us by pumping their bodies up and down like they were doing push-ups, and when that failed to scare us away, they scattered back into their holes. Not surprisingly, there was a large number of birds of prey in the surrounding trees. So much life in such a hostile terrain. As the day came to a close, the clouds darkened and the winds started to pick up. Our guide chose a campsite at the top of a large dune, which he thought would catch the evening breeze. That was an understatement to say the least. Just as we climbed off our camels, a strong wind started to build and it began to rain. Great bolts of lightning struck the surrounding ridges. In the distance, we could see a wall of sand heading straight towards us. We all jumped on to our camels and rode down the ridge into a valley where we spotted a herder’s camp. Nobody was at the camp when we got there, but we unloaded the camels and crawled into what could best be described as a wigwam just as the sandstorm hit. Crowded into the small shelter with a flock of goats which had no intention of staying out in such conditions, our guides immediately started preparing dinner as if they owned the place, going so far as to milk the herder’s goats to make chai. We sat in the blackness with flickers of light coming from the fire waiting awkwardly wondering how the owner of the wigwam would react when he returned to discover four people crammed into his dwelling. We did not have to wait long for an answer. Just as we were starting to eat, he crawled in through the low door. A little surprised at first, he obviously knew our guides and seemed comfortable with our presence, although he was quite shy with us because he did not speak a word of English. (I don’t even know if he spoke Hindi.) We all feasted on curried vegetables until the rain stopped and the winds died down. Our guides felt that it would be best to camp near the wigwam just in case the weather might change once again. Because the herder’s animals were roaming around everywhere grazing on sand, our guides rigged a very awkward bed on the herder’s camel cart, which was far too short for us, but we were in no position to complain. As the night progressed, the clouds cleared and the the sand in the air settled revealing a spectacular, starry sky above us. To a chorus of bleating goats, we spent the night in the fetal position on a camel cart in a valley among the dunes in the Thar desert, a rather unique experience. Yes, sleeping in the fetal position on a camel cart is certainly a unique experience. But believe it or not, I was so exhausted, I slept like a desert log. 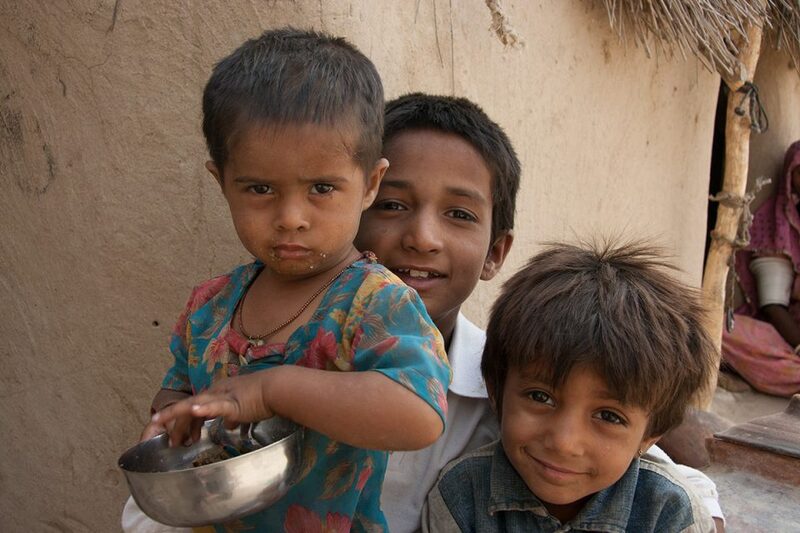 The night was a flash of stars and sand with the echoing cries of kids… that would be goat kids. Somewhere around 6 AM, I pulled myself up on that cart and glanced around. One of our guides had evidently slept through the night on a large water can, lying bent over backwards like some very lost circus contortionist. I could not believe that he had actually slept in such a bizarre position. I lay there waiting to see if he was still breathing – yes, still alive. Further into the desert, we saw very few people. Our guides led us along an interconnecting series of ridges always trying to keep the panoramic views. 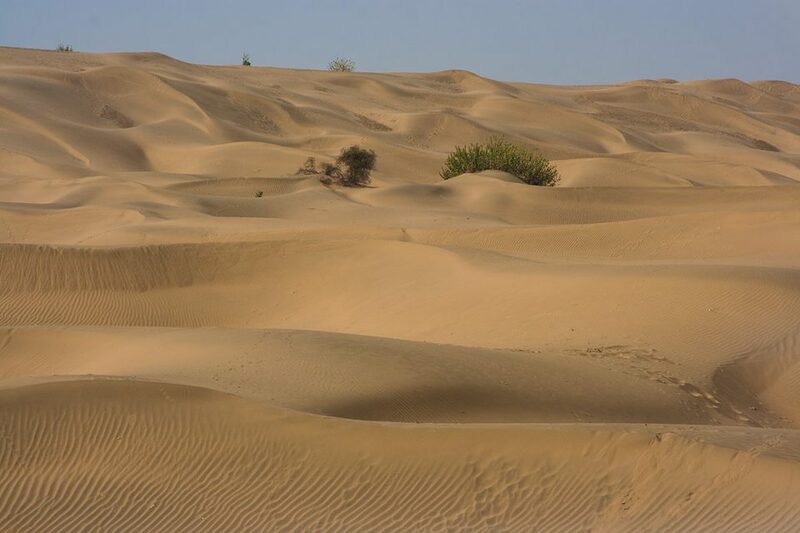 Occasionally we would dip down into valleys and cross to distant ridges, the terrain varying the entire time from flat pans, to forested scrub, to dunes. All morning we saw gazelles darting in and out of the bushes and peacocks in the trees. (The peacocks in this dry terrain just blow my mind.) A variety of colorful desert birds shot in and out of the thorny limbs, at times it seemed like they were actually following us as we rode. 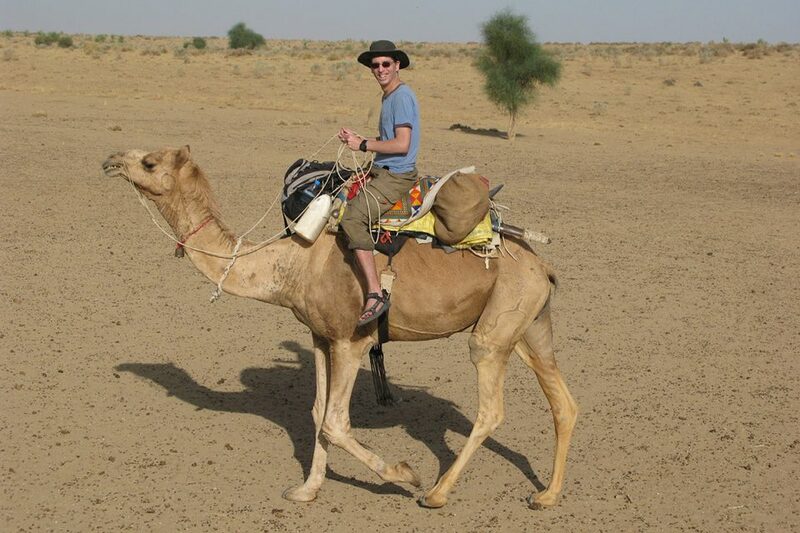 If they are well trained, camels are relatively easy to ride. In fact, I would say it is much easier than riding a horse. They tend to keep walking forward until you signal them to change – there is rarely a fight. However, along one specific ridge, the bushes were full of small green bulbs, which might be best described as camel caviar. They just couldn’t pass it up. Thomas and I struggled, yelled, yanked on the reigns, kicked their sides, whipped them, and cussed. But they just kept nibbling. With much effort, we made our way out of the area and continued on, more successfully, until lunch. Once again, we chose a high dune to sit out the desert heat. A 360 degree view without any human development: no power lines, no villages, no herder’s huts. It was exactly what I had hoped for when organizing the trip (although I will admit it was hotter than hell). Magnificent isolation, a true luxury in India. And then, sometime around 1 o’clock, we could see a person far in the distance walking toward us. He walked and walked and walked; the whole time, we wondered who was coming. Eventually, he climbed up our dune, plopped down next to us, and stared in pure delight. Apparently, he was walking some massive distance across the desert and had noticed us up on the dune. Eager to stare at the foreigners, he had taken a small detour for a little afternoon entertainment to break up the desert monotony. He stared, and gawked, and asked for some water, and then stared and gawked some more. After a couple hours of watching us, he had had his fill, so he continued on his way. That’s India. Once the midday heat started to die down, we loaded up and proceeded across a huge plain of scrub towards some dunes in the distance. We rode for several hours, sometimes galloping for fun. 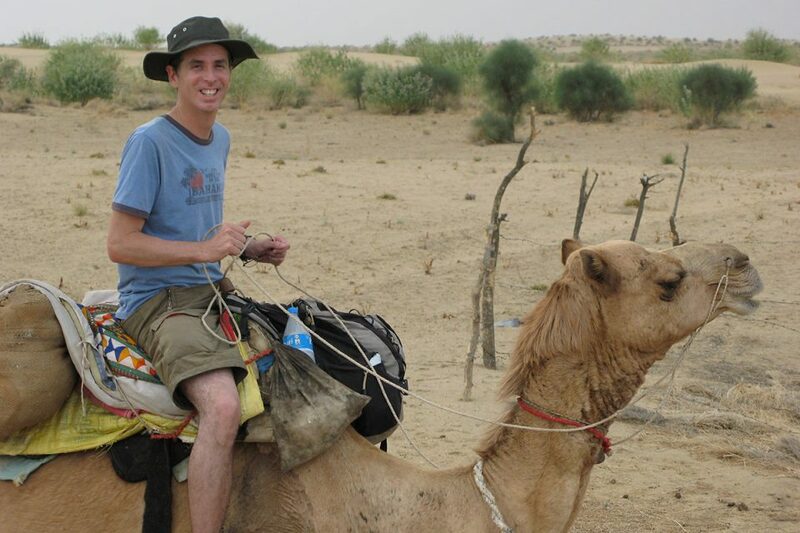 Galloping on a camel is more comfortable to me than galloping on a horse. Somehow the camel seems to bounce and sway less when it is moving quickly, although it’s not at all easy to keep a camel running. They sprint for 10 to 20 seconds and then slow down again. It never lasts long. We also crossed through a few more areas full of camel caviar, which slowed us down. This time, I noticed the guides were also fighting to keep moving. On the far side of the vast plain, we approached a huge sweep of dunes, eventually working our way up on to a long ridge of sand. The sun was starting to set and there were wisps of clouds streaking the sky – I was hoping for a spectacular sunset. The ridge steepened and narrowed into a kind of bridge of sand connecting to a larger, flatter dune face on the opposite side. 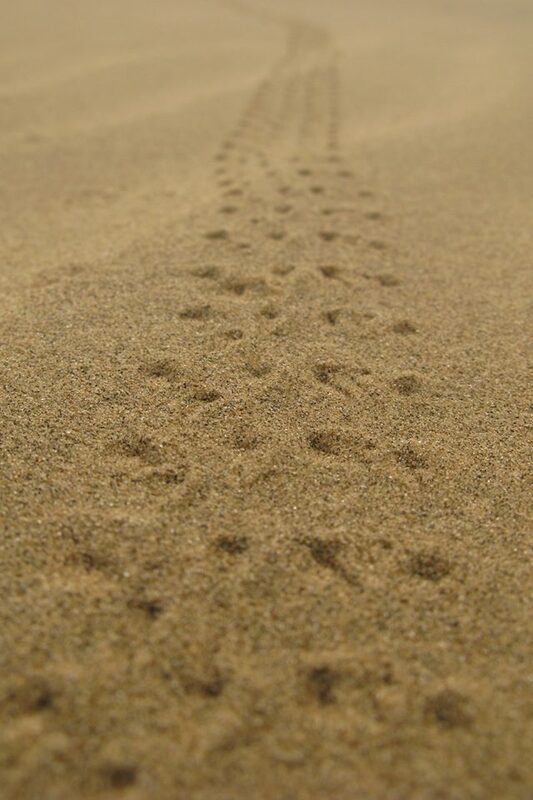 The guides passed across the narrow stretch of sand without any problems and continued on to the flat, table-like dune. My camel, followed closely by Thomas’, tread carefully on to the thin bridge of sand – when suddenly, the dune gave and my camel slipped. From my perspective, which is almost comical, the whole thing seemed to happen in super-slow motion. I could see the steep dune break away and slip out from beneath the camel’s feet. The camel lunged forward, and at the same time, inward towards the dune, trying to catch his balance. The jolt threw me in towards the dune, but I caught on to the side of the saddle and hung there awkwardly, making it even harder for the camel to regain his balance. Now hanging sideways off the camel, big wobbly bony legs seemed to be flying all around my head searching for stability, and the struggle to maintain balance was causing the sand to break and slide even faster than before. So, I made a quick decision: to drop backwards off the camel. I only had a second to make the decision. 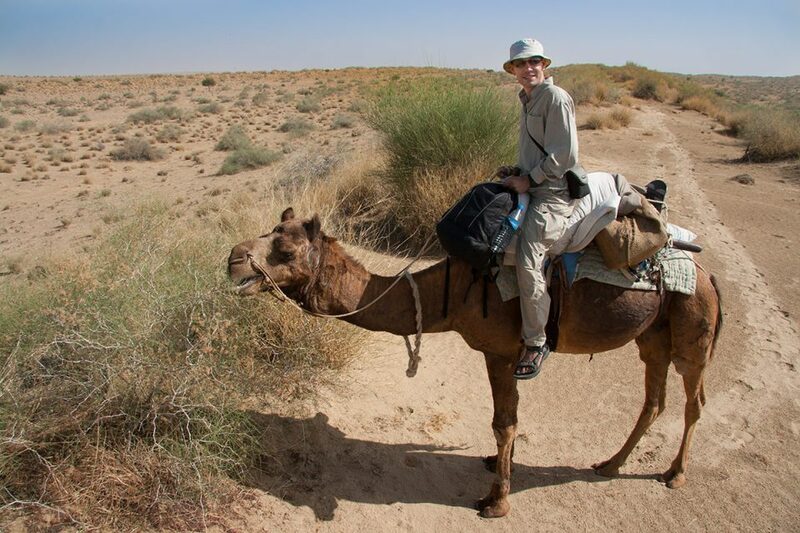 I was afraid that the camel was going to slip further and roll down the side of the steep dune taking me with him. I also knew that dropping off the camel would probably allow him to regain balance. With only a split second to act, I saw there were no rocks below me, so I dropped. It turns out that falling off a camel is very different from falling off a horse – it is MUCH further! The fall was longer and harder than I had anticipated and the impact was fully on my upper back. (Luckily, not my neck or head.) I landed among the camel’s legs, and, pumped up on adrenaline, I threw myself out from under the camel. Only then did I realize that I had really hurt myself. 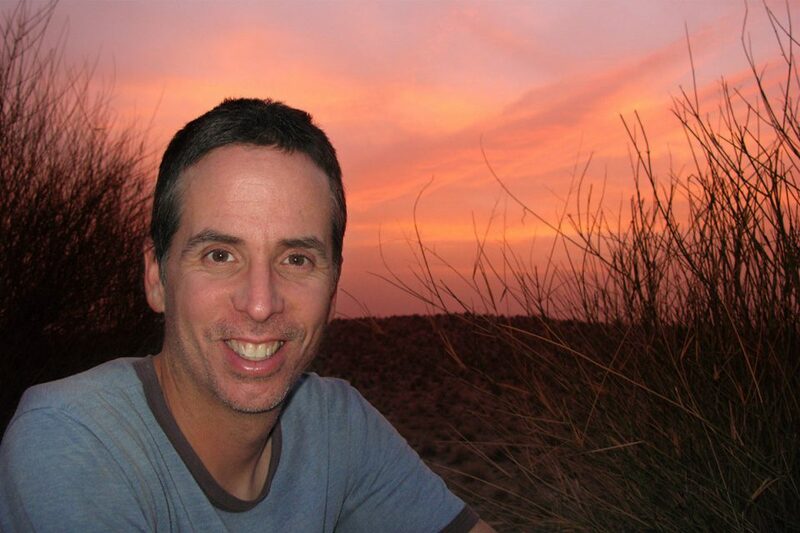 As we were in the middle of the desert and the sun was setting, we really did not have many options. I did not know if I had broken, or more likely, fractured anything, but we had to keep moving to make it to the campsite before dark. 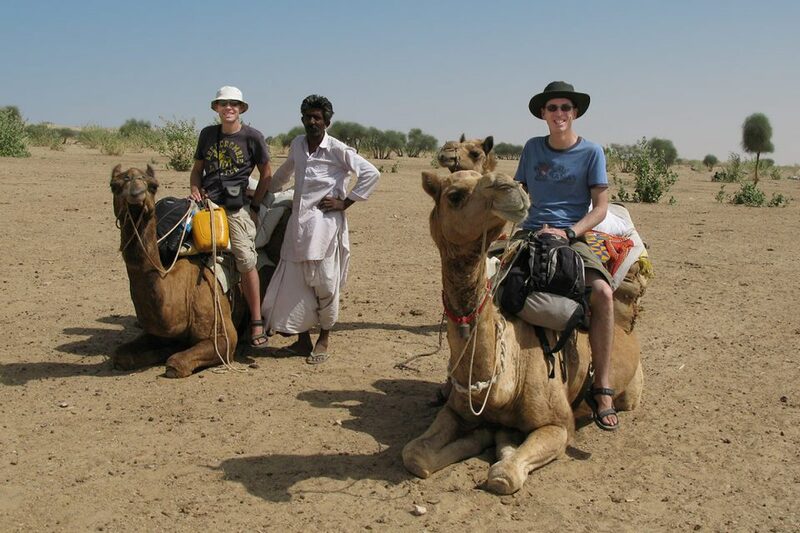 Thomas and the guides got me back on my camel and took me to a flatter area among the dunes, where they set up camp. They laid me out on the sand to rest and I lay there for at least twenty minutes before I got up and started walking around experimentally testing the pain. I was right about the sunset, it was beautiful. The streaks of clouds went pink and high up above the desert valleys, the panorama was breathtaking – not that I had much breath left to take. I oohed and ahhed appropriately and pretended to be OK, but my back really hurt and I was not sure if I had really injured myself, or not. After eating a quick dinner, I drifted off to sleep thinking that the worst pain I would experience that night would be my back. Unfortunately for me, I was wrong. Having injured my back falling off the camel, sleeping on the hard-packed sand in the dunes was traumatic, to say the least. I shifted and repositioned and sought some relief from the pain, but your back is your back, and it is hard not to move it when your are trying to sleep. I spent much of the night staring up into the crystal-clear sky examining the spirals of the Milky Way, which seems startlingly close without the light pollution so common in the developed world. Off to the side of the blanket, a dung beetle worked its way across the sand illuminated by the stars. 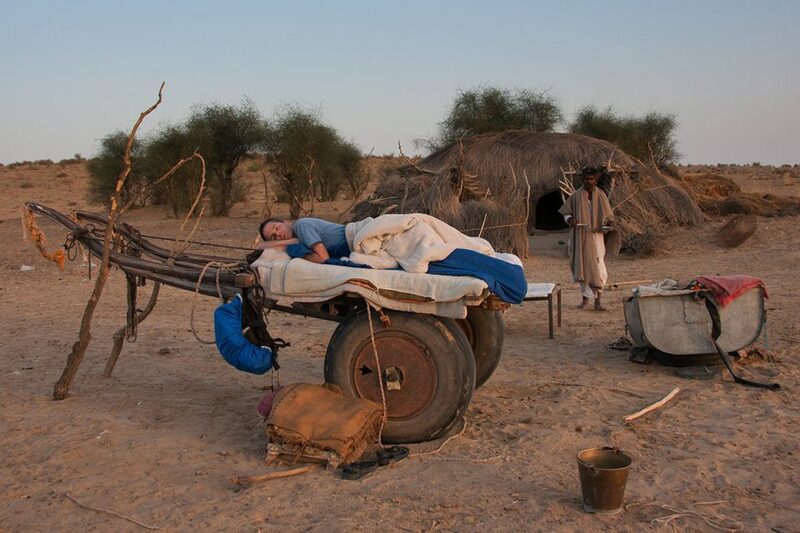 Eager to get some sleep for the long ride back to Khuri, I decided to try lying on my stomach. I carefully turned my body over and delicately lowered myself favoring my back the whole time. Somewhat relieved, I started to drift off again. I must have unconsciously moved my arm forward towards the edge of the blanket, perhaps even on to the sand. Not a smart move. Suddenly, a shocking, piercing pain in my little finger. I bolted up, ignoring the resulting back pain. Something had bitten my finger, and it was starting to swell. An extreme burning in my hand was starting to move up through my arm. I thought that I had been bitten by a snake at first because it was so painful. I screamed for Thomas to wake up, and together we located the flashlight and closely examined the finger. No apparent fang marks. We searched around for what had bitten me, but we were unable to locate anything. The burning continued up my arm and, all of a sudden, the right side of my face started to swell up. Thomas dove into our bags looking for antihistamine pills. After taking a pill, the swelling started to go down, although the bite remained as painful as ever. We were never able to find what had bitten me, but the guides suggested it might have been a scorpion. Assuming that I was not going to die, I went back to sleep. Strangely, my throbbing finger somehow allowed me to ignore the back pain, so I actually managed to sleep through till morning. I awoke around 6 AM, somewhat refreshed, although my back and finger hurt as much as ever. In the wonderfully cool morning air, I walked out along the dune ridge to take in the views; you could see miles in every direction. Determined to enjoy the rest of the safari, I gobbled down a huge breakfast of left-over curried vegetables and rice sprinkled with ants, and we set out on camelback once again. Low on water, we rode away from the dunes looking for a well. After an hour or two of rocking back and forth through the scrub, we came to a small settlement with a well and several small family compounds with the same beautiful mud-washed architecture that we had seen on day one. Our guides suggested that we visit the families, but initially, Thomas and I both declined fearing the same behavior we had seen in the first village full of mafia children. He urged us on and promised there would be no such behavior from these families. 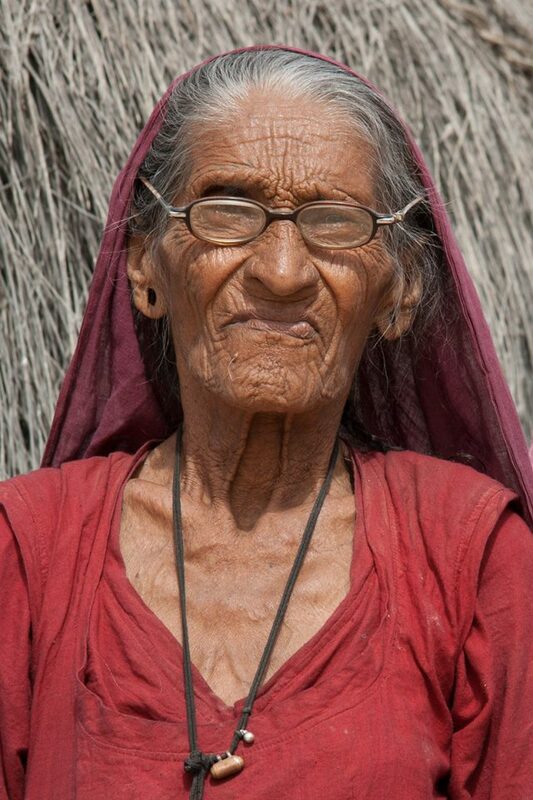 An old desert woman wearing coke-bottle glasses emerged from a hut and glared at us. From a distance our guide noticed the awkward situation, so he came running over to introduce us. Once he began translating, the family suddenly became quite hospitable and invited us to sit in their hut and drink some chai. Three children suddenly appeared out of nowhere and, shyly, came over to sit next to us and watch the foreigners, otherwise known as desert television. The older boy noticed my binoculars hanging around my neck, and asked to see them. Thinking they were a camera as well, he looked the binoculars over expecting to see a digital display, and seemed quite confused about how this “second camera” functioned. I told our guide to explain that they were binoculars, not a camera, but suddenly realized that our guide had no idea what binoculars were either. Our guide looked through them and, pretending to understand what they were, he launched into a long explanation to the family. I have no idea what he told them, but when I looked through the binoculars, they were totally out of focus. I focused them and handed them back to the oldest boy who suddenly started shouting excitedly in his language (not Hindi). I assume his explanation was a little more accurate than our guide’s. After smiling and shaking hands and thanking the family a dozen times for the chai, we climbed back on to our camels and continued on our way. We traveled through a series of sandy valleys moving quickly, often galloping to cover some distance on our trip back to Khuri. Although it was already late in the day and the heat was building, we saw dozens of gazelles as well as a desert fox running along the base of a dune ridge. Birds of prey sat high in stick-like trees. Eagles and vultures circled above, and colorful birds fluttered around dodging danger in the tangled desert growth below. 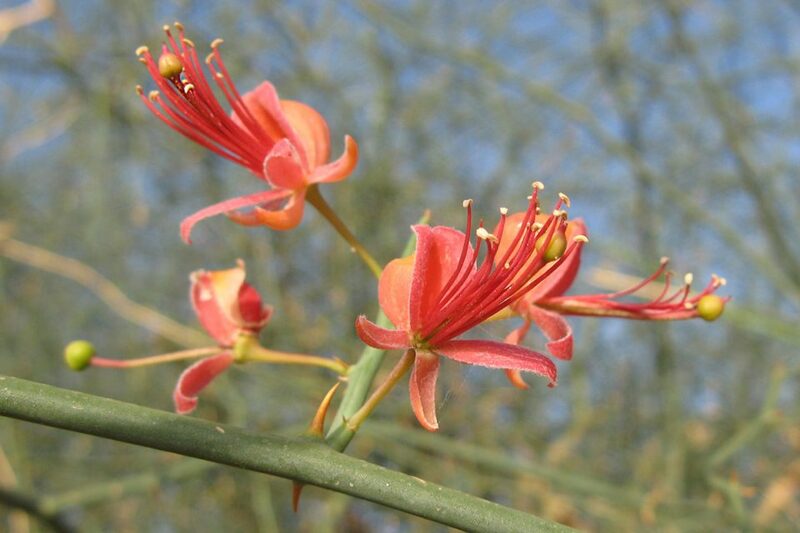 Strangely, delicate red blossoms and tiny yellow orchid-like flowers decorated the thorny bushes, a fanciful artist’s afterthought. Visitors who look quickly at the desert only see a sea of brown, but those who look closer see a masterpiece of nature. Yes, the desert safari is what you make it, and ours was an adventure. 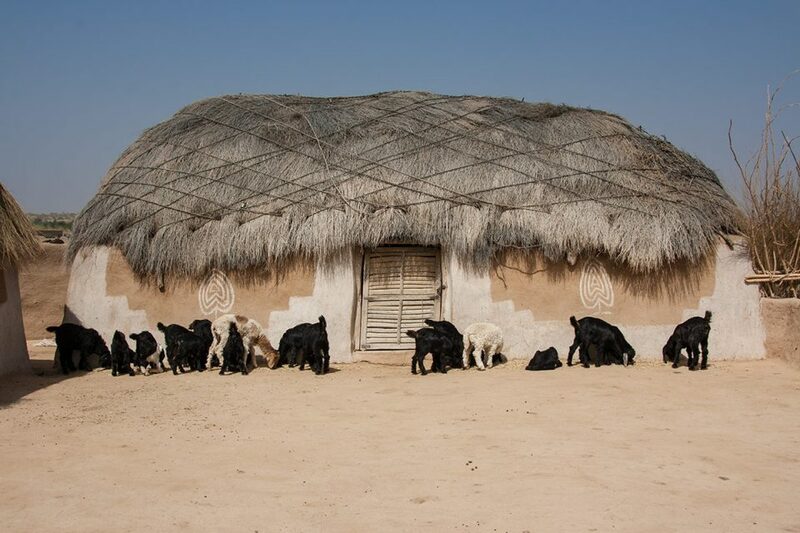 We came to the Thar desert looking for an off-the-beaten-track experience – it was little more than half a day’s ride from Khuri, just beyond the first sadly abused settlement. Wildlife and scenery were our priorities, and looking closely, we found both in plenty. We had hoped to encounter unstaged Rajasthani culture, and although we also bumped up against the staged version, we found very authentic experiences with a kind herder and a curious desert family. 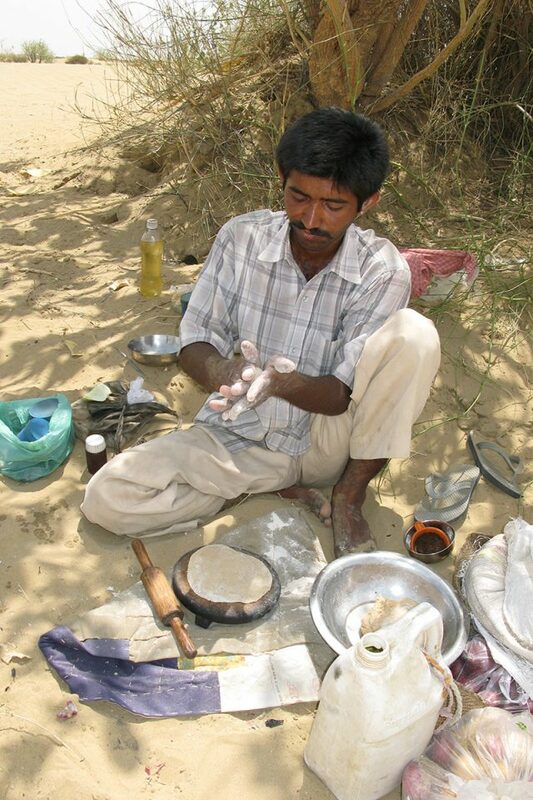 But a true adventure is unscripted, and any visitor to Rajasthan seeking an authentic experience must keep that in mind. Sandstorms sweep the desert, accidents can occur, and poisonous critters creep through the night. Without the challenges, you, too, would be left feeling like you were on a ride at Disneyland. 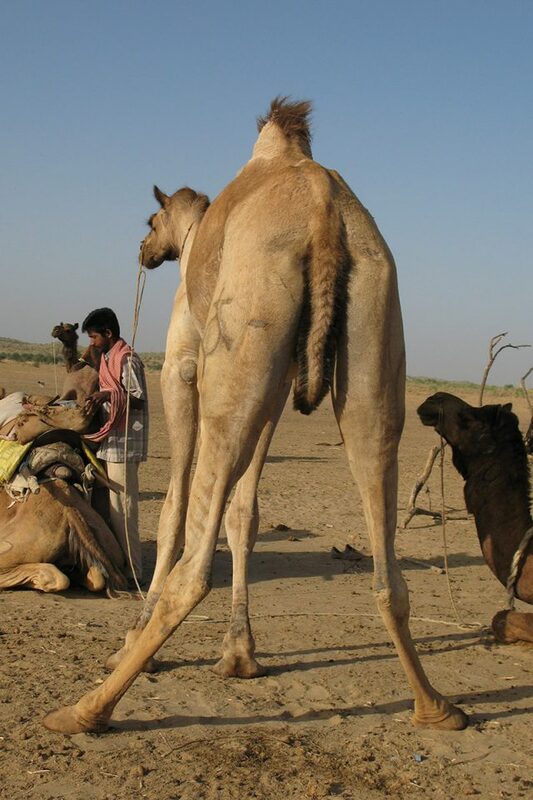 But more than anything, the Rajasthan desert safari is about the camels. The ships of the desert are also the comics of the desert. Lips, buck teeth, and eyelashes on a mountain of bony legs, gurgling and spitting and roaring their complaints through the night, they had me laughing out loud at their antics for three days straight. If nothing else, the desert safari is worth it for the camels alone. I felt like I was actually there experiencing the whole thing with you.